This pressure cooker chicken soup recipe takes only 10 minutes to cook but tastes like it’s been simmering all day. She agreed that classic chicken noodle soup is the best chicken noodle soup. This is why we’re friends. 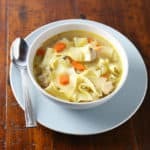 As much as I love a pot of soup simmering on the stove, I love that I can make classic chicken noodle soup in just minutes in my pressure cooker. Because, let me tell you, I think a good 40% if my winter diet consists of soup–and a lot of that is chicken noodle soup. This soup starts by sautéing vegetables in just a splash of olive oil. Since the soup cooks so quickly, it’s tempting to skip the sauté step. I mean, the vegetables will cook anyway, right? They will cook. However, they won’t taste the same. Sautéing brings out different flavors than cooking raw vegetables in the soup. It sounds like it wouldn’t make much of a difference but it does. When sautéd, onions and garlic taste less sharp and the carrots have a lovely sweet flavor that you don’t get if you just throw them into the pot raw. As much as I like shortcut cooking, sautéing the vegetables is one step I wouldn’t skip. 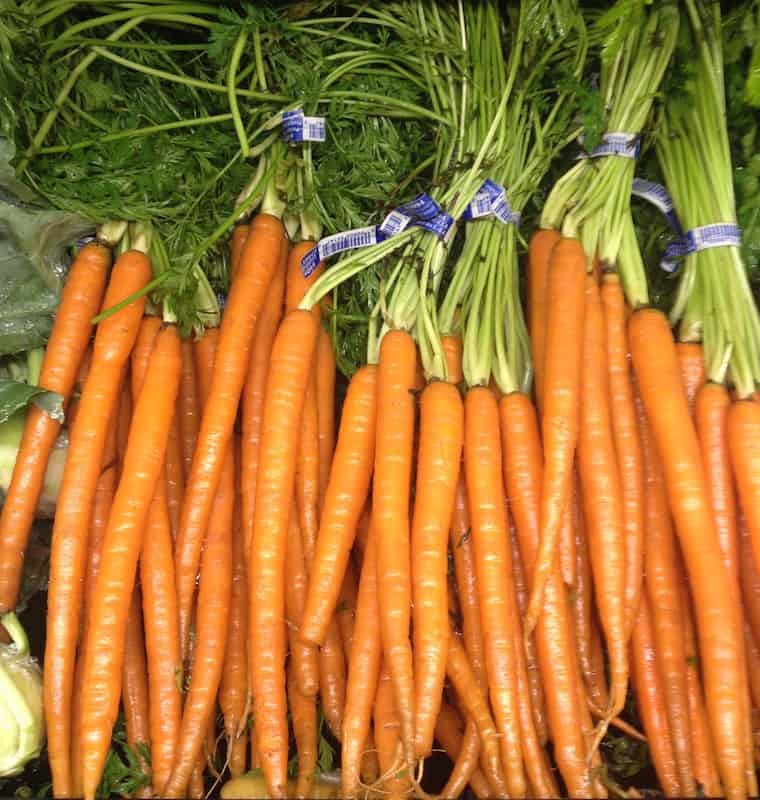 You can save cooking time by chopping up the onions, carrots, and celery the night before. (Mince the garlic right before you use or it will lose some flavor.) Store the chopped vegetables in a covered container in the fridge. When you’re ready to make the soup, just throw them into the hot oil. Oh, and about that container, make sure the lid snaps on tight or your entire fridge will smell like onions. I grew up eating Campbell’s chicken noodle soup which, if memory serves, was made up mostly of mushy noodles and salt. Gosh. I loved that stuff. Even as a kid, I remember thinking there wasn’t enough chicken in the Chicken Noodle Soup. My favorite spoonfuls involved bite-sized pieces of tender chicken. And it always seemed like those cans of soup had one, maybe, of those bits in them. Not this recipe! This recipe makes a soup that’s loaded with pieces of tender chicken. And I wouldn’t have it any other way. 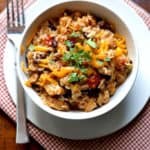 As I mentioned in the recipe for pressure cooker burrito bowls, boneless, skinless chicken thighs are my favorite cut of chicken to use in a pressure cooker. There’s enough fat to keep the chicken moist and tender under pressure. Chicken breasts tend to get rubbery cooked in a pressure cooker. So you’ll rarely see me call for boneless chicken breasts on this site. However, if you want to use chicken breasts, this is a great recipe for them. The chicken gets cut so small that texture isn’t really an issue. That said, I encourage you to try chicken thighs at least once. The flavor tastes so much better than chicken breasts that I bet you’ll love it! Most recipes for chicken soup call for you to cook the chicken breasts or thighs whole and then cut it up after the soup has cooked. I don’t do this. To save time, I cut my chicken thighs into bite-size pieces before they go into the pot. “How does that save time?” you ask. For me, it saves time because I don’t have to remove hot, cooked chicken thighs from the pressure cooker. Cut them while they are too hot to handle. And then return them to the pot. Instead, I chop the chicken, put it in the soup, and when the cook time is done, I can eat. No burning myself on hot pieces of chicken required! 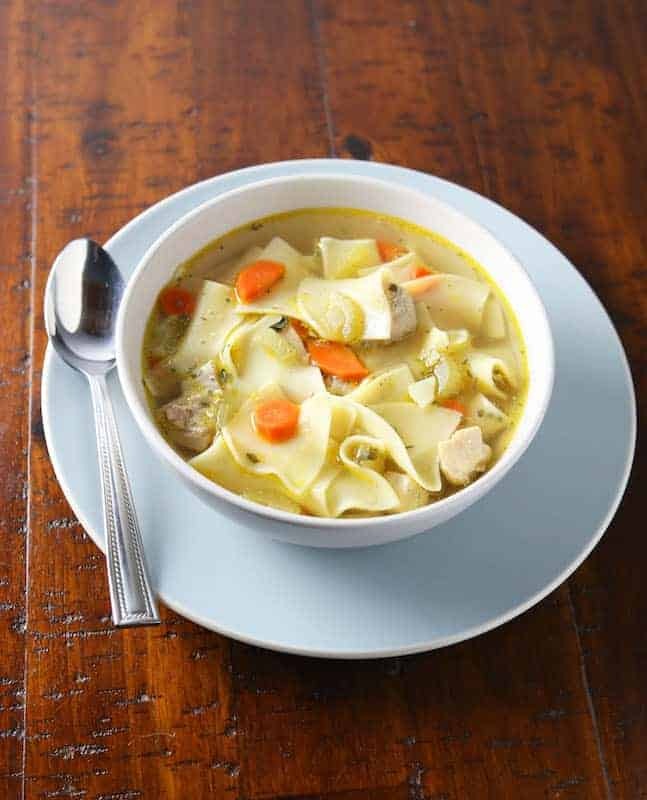 Pressure Cooker Chicken Noodle Soup: The Broth–and a boost. Then I boost the flavor of the soup with a little soup base. Some might call this cheating. I don’t. I call it…enhancing! 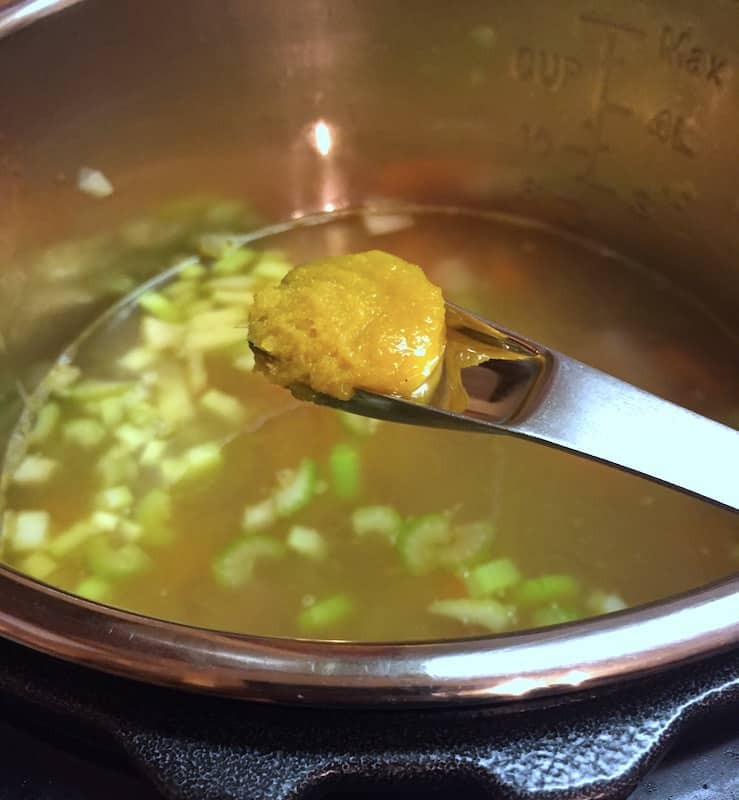 I stir in about a teaspoon of Better Than Bouillon chicken base. Unlike regular dried chicken bouillon, this adds a depth of flavor that makes the soup taste fantastic but not fake. To this day, I have no idea if Mrs. Grass’s soup ever contained dill. My grandmother thought it did and that’s good enough for me*. Now let’s get serious. It’s time to talk noodles! It doesn’t matter what kind of noodles you use in this soup. Use whatever you love. Personally, I’m all about egg noodles. We do need to talk about how to cook those noodles. Don’t get mad at me. Please? Please don’t get mad at me. I don’t cook my soup noodles in the pressure cooker. There. I said it. Noodles cooked in soup makes for a cloudy soup. The starch from the noodles not only makes the soup cloudy, it also mutes the flavors a bit. In this case, I think it’s worth the extra time–and pot–to cook noodles separately and then add them to the soup. 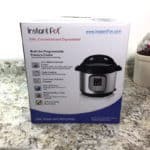 As the pressure cooker builds pressure, I bring a pot of water to a boil and cook the noodles while the soup does it’s thing in the Instant Pot. My noodles are always ready at the same time as the soup. Then I drain the noodles and stir them into the soup. If you don’t feel like dirtying an extra pot, I totally understand. Simply make the soup under pressure. After releasing the pressure, turn the saute function on and bring the soup to a boil. Stir in the noodles an cook until tender. For egg noodles, this takes about 6 minutes. For safety reasons, never fill a pressure cooker more than halfway full. If a pressure cooker contains too much liquid, the hot liquid can spray out of the pressure release valve when you do a quick pressure release. For this recipe, allow the pressure to release naturally for a few minutes before you do a quick release. And, as always, never, ever block the pressure release valve during a quick pressure release. Thanks for the recipe, I added it to my Pinterest board. I use Herb-Ox powdered bouillon packets from GFS. They have no sodium, are MSG free, are super convenient and keep forever. I also use a base, a veggie base from GFS, It’s my secret weapon like Dill is for you. Anyway, I’ve owned 3 pressure cookers for years and am just discovering the joy of using them so thanks. If you use chicken with bones to make the soup, then you can remove the bones and cook them down into bone broth. Keep in the freezer for your next soup! I am glad someone else uses the same bouillon base as me 🙂 I am currently making this and I agree with you on everything from the base to the dill to the noodles! 🙂 Thank you for sharing! This was delicious! I made it for a friend who was under the weather today. Thank you for making it easy for a novice chef like me. hi! This soup looks delicious and I’d like to make it today! Are you using raw chicken thighs or pre-cooked chicken in this recipe? The recipe uses raw chicken thighs. Enjoy dinner! The chicken noodle soup recipe is terrific. Any chance you could try your hand at avgolemono, the Greek chicken/rice/egg /lemon juice/soup? If you do, please share your method. Oooh! I’ll give it a try! Wow. Just Wow!!! What a fantastic recipe – quite possibly the BEST I’ve ever made! Used chicken tenderloins (since I had it on hand) and added cayenne pepper for a little heat. The dill is GENIUS. Will certainly be make me this “MY” recipe – thanks SO much for sharing!! Sorry about that! Not sure why serving disappeared. It serves about six. I’d prefer to use boneless skinless chicken breasts. How many (or weight) would be the appropriate substitute for the thighs? Thank you! About 12 ounces–which is usually 2 to 3 breasts. Enjoy! Recipe looks great! Do you put the setting on poultry or soup?? Looks delicious, do you cook for 10 min after the pressure builds? Yes. The cook time is always for after the pressure has been achieved. This was VERY good! I didn’t change a thing. I cooked the noodles in the pressure cooker at the end, it was very yummy. Perfect for my son who is sick. The dill is so good. 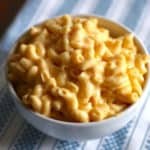 This is my go to recipe going forward. Thank you! Glad you enjoyed it and I hope your son feels better soon! Have you tried sauteing the chicken as well as the veggies. That’s what I do because I just like the texture better. You certainly can. It won’t hurt anything. Enjoy! I fixed this soup on Saturday and it didn’t last long between me and hubby. I grew up on homemade chicken noodle soup and this tastes EXACTLY like what my Mom used to make. It was absolutely awesome! Even though it’s April in northern Utah and raining mixed with a little snow (tough for a South Carolina girl), this amazing soup is just incredible and takes me back to cold winter days in the South when my Mom made a similar soup. It is just incredible. The only change I made was that I used chicken breasts because that’s what I had on hand. Definitely a five-star recipe. I’m making it again today! If I used rotisserie chicken do I add that in with the veggies and then reduce time, would 4 minutes do? Or should I add chicken in after? I’d stir the chicken in at the end since it’s already cooked. 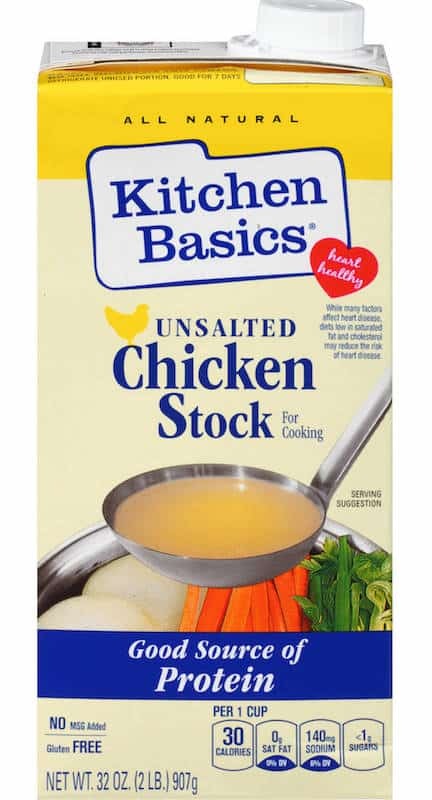 Any reason for using chicken broth instead of chicken stock? If you have homemade chicken stock, go ahead and use it. The two are interchangeable. What about store-bought broth vs. store-bought stock? Delicious! I added chopped chives instead of the celery and added whole bella mushrooms to the saute and it was sooo good. Just made this for my family and it was a big hit! Love how quickly it came together for a sick and rainy day meal. Thank you!